"Contrary to widespread consumer belief, organic farming is not the best way to farm from an environmental point of view. [T]here are now several cutting edge agricultural practices which are good for the environment, but difficult or impossible for organic farmers to implement within the constraints of their pre-scientific rules. "Increasing the proportion of agriculture that uses sustainable, organic methods of farming is not a choice, it’s a necessity. We simply can’t continue to produce food far into the future without taking care of our soils, water and biodiversity. Many people believe that organic food is safer, healthier, grown “without pesticides” and avoids “harmful” intensive farming practices commonly associated with conventional agriculture. But both organic and conventional farmers use pesticides–organic farmers use natural ones and some approved synthetics. The debate also has taken on ideological connotations with anti-GMO campaigners embracing organics as a symbol of ‘agro-ecological’ farming while conventional growers see intensive farming practices as more efficient, resulting in higher yields with lower ecological inputs and impact. Among scientists, there are fierce differences of opinion over whether conventional or organic farming has a larger environmental footprint. Organic farmers generally use less toxic chemicals and pay closer attention to soil health–organic matter, nutrients and microbial activity. Conventional agricultural intensification has a historically notorious record of wasting water, overusing fertilizers and pesticides, and polluting habitats. That’s changing as conventional farmers focus more on best practices. Multiple studies show that non-organic farming yields considerably more food with lower costs and in some cases lower inputs per acre. It often uses less water; and some GM crops, such as insect resistant Bt corn, soybean, cotton and eggplant, require less chemical pesticides than their organic counterparts. Chemicals are only part of the sustainability equation. Eco-responsibility means different things to different experts. Greenhouse gas emissions? Productivity per acre? Land usage? Labor intensive vs. mechanized agriculture? There also are less measurable practices such as treatment of farm animals. These and other factors are part of a complex value-based computation of what constitutes agricultural sustainability. Overall, the cultivation of GM crops over the last 18 years has delivered substantial benefits for the environment. Insect-resistant crops have resulted in a 230 million kg decrease in the use of insecticides. Herbicide-tolerant crops have led to reductions in fuel use and CO2 emissions of 6.3 billion liters and 16.8 million metric tons respectively, by supporting no-till farming. Overall, GM crops have produced an environmental benefit of 37%. Many consumers spend more for organic food to avoid genetically modified products in part because they believe that “industrial agriculture” endangers the environment and produces less nutritious food. Many agroecology supporters also argue that a global move towards sustainable, organic agriculture is necessary to save the planet from the misuse of harmful chemicals and protect fragile soil ecosystems. Currently about 1 percent of the world food supply is grown using the kind of organic principles embraced in the United States and Europe. Organic agriculture is an ecological production management system that promotes and enhances biodiversity, biological cycles, and soil biological activity. It is based on minimal use of off-farm inputs and on management practices that restore, maintain, or enhance ecological harmony. The primary goal of organic agriculture is to optimize the health and productivity of interdependent communities of soil life, plants, animals and people. The USDA additionally states that crop products that receive a certified organic label must be free from genetic modification; grown without conventional fertilizers and pesticides; and processed without food additives or ionizing radiation. In addition, animals must be raised without the use of artificial hormones and antibiotics. When establishing the organic standards, both the USDA and the industry stressed that the organic seal should not convey food safety, quality or nutrition information. Secretary of Agriculture Dan Glickman stated, “Let me be clear about one thing. The organic label is a marketing tool. It is not a statement about food safety. Nor is ‘organic’ a value judgment about nutrition or quality.” Nonetheless, many customers willing to spend more for the seal or a non GMO label do so because they believe that their food will be “safer,” “healthier” or more “environmentally friendly”—despite an absence of evidence to support that belief. The guiding principal of organic—relying on ‘natural’ inputs—was forged early in the 20th century before toxicology, environmental studies and climate science emerged. Although there is much wisdom in organic farming, some methods are dated and contradict what we know about modern ecological practices. The issue of sustainability is complex and confounding. For example, the growing demand for organic and non-GMO products in the U.S. has prompted some manufacturers to switch to less sustainable sources. Chipotle abandoned the use of GMO soy oil, switching to what it claimed was ‘more sustainable’ sunflower because, it stated, soy products have been linked to the growth of herbicide-resistant so-called superweeds which have proliferated with the increased usage of glyphosate. Chipotle does not tell its customers that the sunflower oil that replaced the soy oil is derived from seeds developed using conventional breeding techniques to resist an herbicide called an ALS inhibitor. It’s actually more resistant to herbicides than GMO soy–so Chipotle’s decision to replace soy oil with sunflower oil results in the use of more chemical inputs, not less. Pressured by anti-GMO groups such as GMOInside and wary consumers, many small firms and some large food companies–Hershey is the most prominent–are switching from so-called GMO sugar (sucrose made from herbicide tolerant sugar beets) to sucrose made from non-GMO sugar cane. Sucrose contains no DNA so there is no detectable difference between sugar from GMO or non-GMO sources. The improved weed control provided by Roundup Ready varieties led to rapid environmental gains. By 2009, only two years after widespread adoption of GMO sugarbeet, over 50,000 acres of land was converted to some form of reduced or conservation tillage practices in Nebraska, Colorado, and Wyoming. That number is probably much higher now. Conservation tillage practices improve soil health, reduce soil erosion, and preserve soil moisture. Conservation tillage simply wasn’t possible in sugarbeet before the introduction of Roundup Ready varieties, because intensive tillage was needed to obtain adequate weed control in the crop. Using glyphosate rather than a mix of more toxic chemicals, more frequently applied, has resulted in both a reduction in chemical usage and a sharp increase in yield. Photos show two different fields on the same day during a 2002 weed study in Nebraska. Sugar beet yields increased substantially after the introduction of Round-up Ready sugar beets. Source here. The demand in the U.S. for organic feed for cows to serve customers who want to buy milk, eggs and meat sourced from cattle not fed GMO grain has also caused another sustainability problem. Eggs and meat sold at Whole Foods and other organic marketers are now being imported from Romania, Ukraine and India where ecological standards are much lower than in the U.S. Transportation import costs add to the greenhouse gas problem. Claims by organic supporters that conventional agriculture and the use of GMOs in particular has caused a dramatic increase in chemical usage is commonplace, often repeated in media accounts. Those claims are based almost entirely on the research of Charles Benbrook, an organic industry consultant. Benbrook claimed in 2012 that the use of GMO crops has “backfired” and results in unsustainable increased use of pesticides (both insecticide and herbicide) of 7%, almost of it due to the increase in glyphosate tied to herbicide resistant GMO crops. Graham Brookes of PG Economics published a peer reviewed report earlier that year using the same data that reached a different conclusion: GM crops may actually have reduced worldwide pesticide use by 9.1%. I’m not convinced Benbrook’s methods accurately approximate what soybean growers (or cotton or corn growers) would be doing if GE technology never existed …. it is not reasonable to assume that the 10% of growers who did not adopt GE crops are representative of what the other 90% would be doing if [GMO] technology never existed. I don’t think it is possible to say for sure what the impact of [GMO] crops has been. 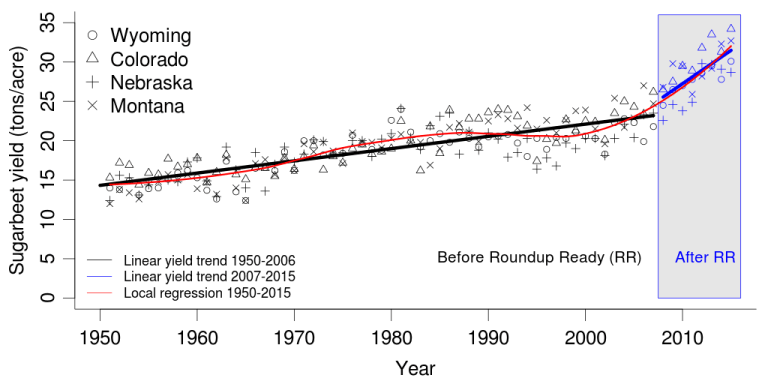 My personal opinion – based on the data I’ve analyzed – is that we’ve probably seen a net benefit [eg, reduction] with respect to both toxicity and the evolution of ‘superweeds.’ And one could even make an argument that adoption of GE crops has slowed the increase in herbicide use. Despite the relatively minor effect HT crop adoption has had on overall herbicide usage, HT crop adoption has enabled farmers to substitute glyphosate (which many HT crops are designed to tolerate) for more traditional herbicides. Because glyphosate is significantly less toxic and less persistent than traditional herbicides, the net impact of HT crop adoption is an improvement in environmental quality and a reduction in health risks. Conventional farmers use synthetic chemicals and are more likely to use mono-cropping, which can reduce biological diversity. In conventional systems, farmers apply pesticides and herbicides to crops at a more efficient rate if they are made up of just one type of plant, but this practice has unintended consequences. Because the goal of conventional agriculture is to maximize yields, environmental health can be challenged if farmers are not sustainably minded. 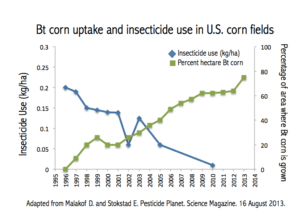 The USDA statistics also show a 10-fold decrease in insecticide use since the introduction of Bt (insect resistant) corn and cotton. By 2010, only 9 percent of all US. 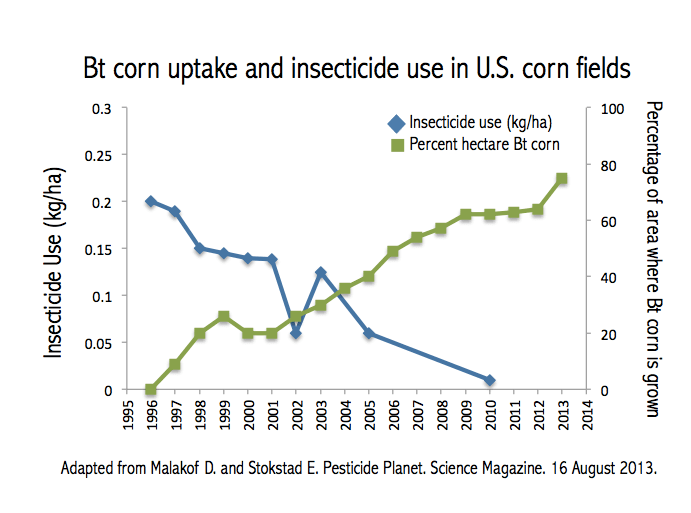 corn farmers used insecticides, and the number has dropped to below 5% since then. “This is consistent with the steady decline in European corn borer populations over the last decade that has been shown to be a direct result of Bt adoption,” the government reported. Even small reductions in insecticides leads to big increases in beneficial insects, increasing ecological diversity. Organic advocates cite numerous studies that suggest the environmental and economic impact of organic farming is less than conventional farming. In a study comparing 14 organic arable fields with 15 conventional ones in New Zealand, the total economic value of biological pest control, soil formation and the mineralization of plant nutrients in the organic fields was significantly greater. That said, organic farming is less efficient in certain soil conditions, such as high-alkaline or high-acidity environments. Not only are organic pesticides not safe, they might actually be worse than the ones used by the conventional agriculture industry. Canadian scientists pitted ‘reduced-risk’ organic and synthetic pesticides against each other in controlling a problematic pest, the soybean aphid. They found that not only were the synthetic pesticides more effective means of control, the organic pesticides were more ecologically damaging, including causing higher mortality in other, non-target species like the aphid’s predators…. Some natural chemicals don’t work as well, requiring larger quantities, another sustainability problem. [C]opper-based fungicides are among the few options available to an organic grower for the control of fungal plant diseases. These are high-use rate products that require frequent re-application and which are quite toxic to aquatic invertebrates. There are much more effective, and far less toxic, synthetic fungicide options without environmental issues, and which, unlike copper, break down into completely innocuous materials. Organic growers can’t use those fungicides. Similarly, there are many environmentally benign, synthetic insecticides and herbicides which cannot be used. It’s important to underscore that most organic practices and chemicals are both effective and safe. As to differences between the two categories, “You can’t generalize that broadly,” said Rob Wallbridge, a retired organic farmer in Quebec, Canada. “Every pesticide has a different profile, and there are many different ways to define safety.” Wallbridge added that the Canadian study Wilcox cited was a laboratory experiment that didn’t actually evaluate real-world organic pest control practices. It’s also important to note that conventional farmers are allowed to use organic-approved pesticides, and they often do so. For example, the most popular organic insecticide, Spinosad, is widely used by conventional farmers as well, according to data from the California Pesticide Information Portal, compiled by Savage. Dow Chemical sells the organic version as Entrust and the conventional version, which contains different adjuvants, as Success. Spinetoram, a synthetic derivative, is sold as Radiant. The fact of the matter is that all pesticides, whether used in organic or conventional agriculture are subject to the same regulations, enforced by the federal Environmental Protection Agency (EPA), state and local governments. And while it’s true that some pesticides used in organic farming are more toxic than their synthetic counterparts, most pesticides in use today are classified by the EPA as Category IV “essentially non-toxic,” Savage has pointed out. In short, the application of GE technology to the improvement of crops does not, in itself, limit the overall diversity of the crops, whereas the development of modern agriculture, in which certain genetically defined strains are grown over wide areas and other strains that were cultivated locally earlier may disappear, does. The preservation of genetic diversity in crops is important and of general interest, but the appearance of GE crops did not cause the problem or advance its spread. 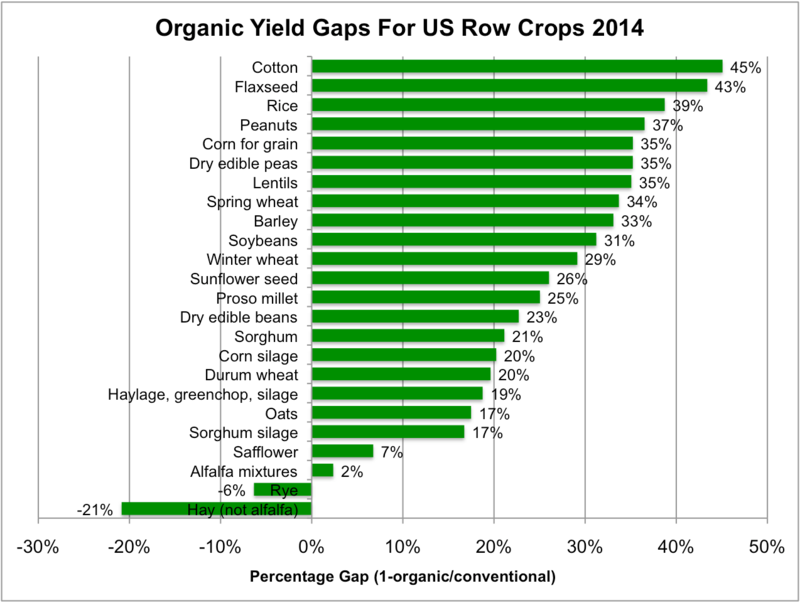 For 2014 in the US, Steve Savage examined USDA data and found organic corn faced a 35% shortfall; soybeans 31%; and cotton 45%. It also costs more per acre to produce organic crops, which have substantially higher fuel, labor and capital costs. Population growth and growing affluence in the developing world will require a sharp increase in necessary food calories, which can only occur by expanding farmable acreage. Relying on lower-yield organic agriculture, while offering mixed sustainability benefits, could threaten the world’s remaining forests. In smallholder-dominated landscapes of lowland Sumatra, forest cover has diminished drastically over the past 20 years and current land-use choices favour the adoption of the most profitable monocultures. These changes led to higher crop production and incomes among smallholders, but were accompanied with declines in multiple ecological functions directly related to biodiversity conservation, climate regulation and water quality. Many scientists contest those claims. One of the great early advances of organic farming was the use of compost to promote soil health. But there are sustainability trade-offs. During the process of composting methane is emitted, a greenhouse gas 30 times more potent than carbon dioxide. Methane is also released in catastrophic amounts by flatulent cows, the primary generator of organic waste for use as fertilizer. Cattle livestock is already blamed for generating nearly 20% more greenhouse gases in terms of carbon equivalency as compared to driving automobiles. 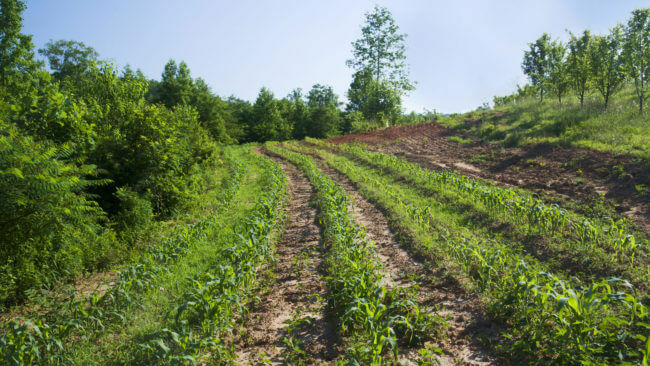 Conservation tillage (including no-till, ridge-till, and mulch-till) is known to provide environmental benefits and is facilitated by use of HT crops. 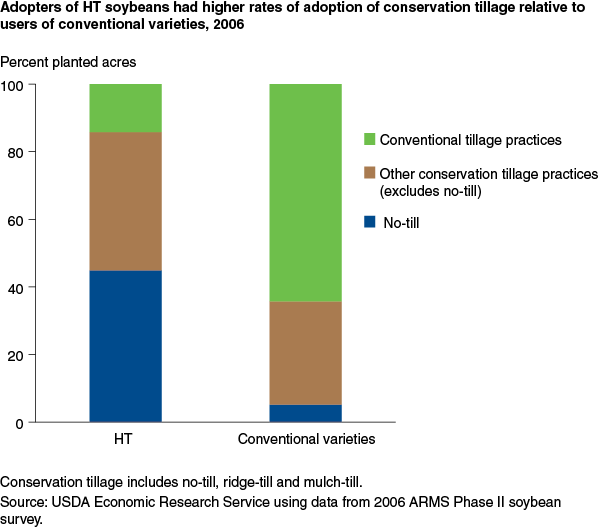 … By 2006, approximately 86 percent of HT soybean planted acres were under conservation tillage, compared to only 36 percent of conventional soybean acres. Differences in the use of no-till were just as pronounced. While approximately 45 percent of HT soybean acres were cultivated using no-till technologies in 2006, only 5 percent of the acres planted with conventional seeds were cultivated using no-till techniques, which are often considered the most effective of all conservation tillage systems. There is an emerging science consensus that GMO crops and conventional agriculture in general are more sustainable when carbon emissions are factored into the equation. A 2016 study by Purdue University researchers found that agricultural greenhouse gas emissions would increase by nearly 14 percent if there were a ban on GMOs. As GMO find wider and wider usage, there is a corresponding growth in the popular hysteria surrounding the technology. Environmental activists push for GMO bans, without adequately considering the impacts such bans might have. The losses associated with a global ban would be twofold: the losses actually realized and the potential losses when compared to an alternative adoption schema. 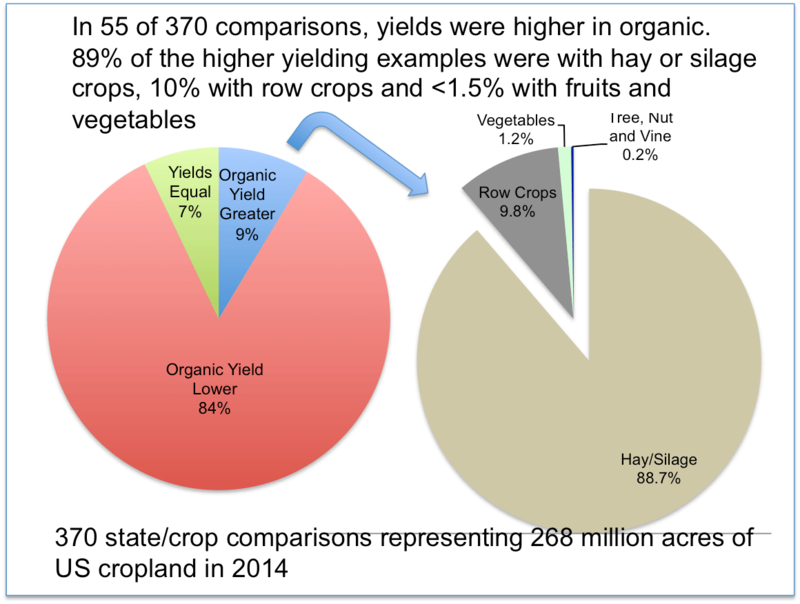 The fact that more land use leads to greater climate impact has not often been taken into account in earlier comparisons between organic and conventional food …. This is a big oversight, because, as our study shows, this effect can be many times bigger than the greenhouse gas effects, which are normally included. Global food output is expected to roughly double by 2050. Organic farming has much to offer but overall, conventional farming produces more food per acre, while costing less and requiring fewer inputs. While commendable on a small scale, organic farming remains a boutique option as part of a nationwide or global food system as it is not scalable as conventional agriculture. Organics does provide clear advantages in some local food growing regions. If we wanted to reduce pesticide use and nitrogen runoff by turning all of the world’s farmland to organic farming, we’d need around 50% more farmland than we have today. … Clearing that much land would produce around 500 billion tons of CO2, or almost as much as the total cumulative CO2 emissions of the world thus far. … That’s not a viable path. The chemicals we used to put on the beets in [those] days were so much harsher for the guy applying them and for the environment. To me, it’s insane to think that a non-GMO beet is going to be better for the environment, the world, or the consumer. Organic farming advocates say that argument misses the point: Organic and non-GMO farming are necessary components to preventing the degradation of the soil that has occurred in some regions of the world as part of the Green Revolution, dependent on fertilizers and pesticides, which dramatically altered farming practices 60 years ago. Since genetic modification is a seed-breeding process, organic advocates could embrace the technology, sowing GM seeds while using advanced synthetic chemicals, while otherwise using organic growing practices–the best of both worlds, some say. But that proposal was rejected by the US organic community when certification regulations were formulated in the 1990s. Nevertheless, many conventional farmers are adopting the best organic practices and some organic farmers are embracing what organic purists would call heretical beliefs. Amy Hepworth, an organic farmer in New York’s Hudson Valley, who believes in the importance of soil health and working with nature told the New York Times that science and technology, deployed judiciously, can help her with achieving her sustainability goals, sometimes with fewer adverse effects than natural substances. “Natural doesn’t mean safe,” she said.